Open source software and hardware are about to take a giant, if futile, leap into space, thanks to two “CubeSats” that ascended into the heavens in the HTV-4 “transfer vehicle” that also carried a humaniform robot to the International Space Station (ISS). The two CubeSats, named because they are cubes ten centimetres on each side, were crowdfunded, weigh less than 1.3kg apiece and are built with Arduino single board computers. The boards run FreeRTOS, a free real time operating system. Two satellites, ArduSat-1 and ArduSat-X, went aboard HTV-4 Both will be launched by the ISS' robot arm. The satellites bear solar panels to power their electronic innards, but lack propulsion. They'll therefore circle Earth for as long as the laws of physics permit but NanoSatisfi, the company behind the satellites, is selling a week of processing time so they should stay aloft that long before being destroyed by the heat of re-entry. Winners, or the many schools and individuals who purchased time on the satellites, upload code (Arduino's tool is GPL-licensed) from a web interface. 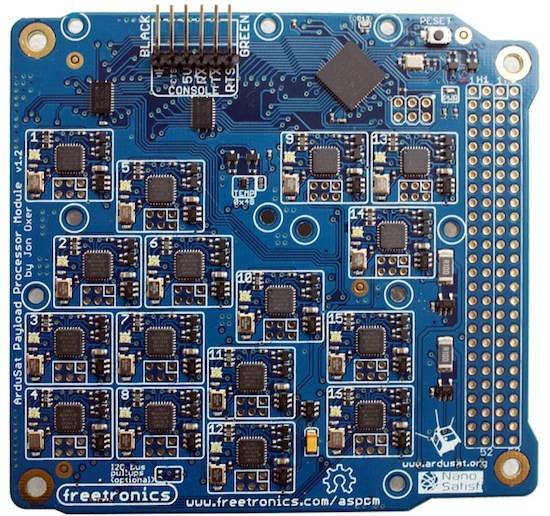 The heart of each CubeSat is the ArduSat Payload Processor Module (ASPPM, depcited below), a single board computer that packs the equivalent of 16 Arduino Uno boards into one. Each processor is dedicated to its own experiment, while a seventeenth processor takes care of the myriad other chores needed to keep the satellites functioning, including making experiments' results available as downloadable .CSV files. The ArduSat Payload Processor Module. Each rectangle is a discrete computer.